Coffee and Beer: Coming soon to outdoor retailers? The cycling shop craze might become the next greatest fad for specialty retailers. How do you make an outdoor shop feel cozy, luxurious and a bit more like home? Offer a refreshing beer, warm food, or steaming cup of Joe to help fuel consumers through their buying decisions and—perhaps hours—of geeking out on the newest technology and trails. Two Harbors, Minn., is about to get that grand slam of shops. Aiming for a launch on Memorial Day weekend, Dan Cruikshank—former owner of the well-established outdoor gear manufacturer Granite Gear—is opening a full-service bike shop that will offer more than a two-wheel tune. The cutting-edge venture, SpokeNGear, will be a single-stop storefront that sells, yes, bikes and outdoor apparel, but also local food, coffee, and craft beer. The goal? 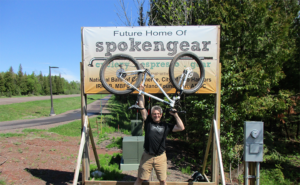 To fill the community’s needs and become the “best coffee shop in Two Harbors,” the sole bike shop, a hangout for locals and visitors to chat about local trails and a provider of bicycle tour equipment, Cruikshank says. “We want to be known as the bicycling center of our north shore region—and as the area’s coffee shop,” he said. After all, the Adventure Cycling Association is booming, Cruikshank said, which has experienced a 40 percent growth in members in the last decade. To top it off, Cruikshank will use his pack-building prowess—accrued from nearly three decades of running Granite Gear—to hand-make bike bags on site. SpokeNGear could very well be the only outdoor shop that offers this unique blend of services in the country: that is, one location that fuses together a café and food, a bike and outdoor gear shop, as well as bag manufacturing. “My take on the bike specialty shop is a little bit different. I’m also going to be making the bicycling bags in the back, so there will be a manufacturing component as well. There are a couple of shops that have bag making, now, but there’s only a couple in the country. My shop might be the only one like it in the country,” said Cruikshank. Avant-garde, multi-service bike stores are dubbed New-Wave and Outlier shops, according to market researcher Jay Townley, who compiles data for the National Bicycle Dealers Association (NBDA). In 2013, there were 100 in the U.S. Now, that number has more than tripled—there could even be up to 500, estimated Townley, who was in the data-crunching phase at print. Of the 3,950 bike shops across the U.S., close to 13 percent have coffee shops. Just over 6 percent serve beer. Nearly 3 percent offer yoga sessions and 11 percent host spin classes. On the lower end, a tad more than 1 percent serve full-service restaurant food, all according to the most recent 2015 National Bicycle Dealers Association (NBDA) Specialty Retail Channel Study and Report. Could the burgeoning New-Wave-and-Outlier movement catch traction among not just bike shops, but specialty retail shops, too? And even help small, local shops stay relevant, and ensure a steady stream of customers in the wake of big-box and online competitors? Providing multiple services can certainly leverage marketing opportunities. And, diversifying services—especially in quainter, seasonal towns—can help buoy sales during periods when overall foot traffic slows down. In Two Harbors, coffee sales will most likely rise during the cold winter months and help make up for the tourist lull, said Cruikshank. During those slower months, he also plans to get ahead on stocking those handmade bags for the spring. In the summer of 2014, Alchemy Bicycle Company—manufacturer of hand-built bicycle frames—opened a retail location (sans mechanic) along Denver, Colorado’s Cheery Creek Trail and the Rollout Café, an espresso bar with food that serves local Mission Roasters coffee from Colorado Springs. They learned the tricks of the trade the hard way, said owner and founder Ryan Cannizzaro. A fine cup of coffee requires consistency.“You can’t assume that you know how to run a coffee shop because you know how to run a bike shop, or vice versa. You are running two businesses and need talented, experienced people in both [areas],” said Cannizzaro. But the growing pains have been worth it. Caffeine goes foot-in-pedal with bike culture. “Cyclists tend to like the caffeine before, after or during their ride,” said Cannizzaro. “[A café] gives the retail shop an opportunity to be a part of the community, and gives the community a place to gather while cycling,” he said. Plus, while everyday bikers may not need to buy a high-end frame on the spot, offering a community space helps to foster brand loyalty for the day that they do. It seems like a no-brainer way to drive traffic into your store in a struggling brick-and-mortar economy, right? So why aren’t traditional outdoor shops scrambling to adopt the model? Jennifer Mull—CEO of Backwoods, which operates 10 retail fronts—has considered the integration of other services, but hasn’t made any plans, yet. “There’s a little bit of difference in terms of a bike shop in regards to culture,” said Mull, who also served as the advisory board Chair for RISE (Retail Inspired Specialty Excellence), an educational program for specialty outdoor retailers that took place at the 2016 Outdoor Retailer Winter Show. Cyclists bike to and from a bike shop, Mull said. In other words, they do the athletic pursuit for which they share a passion, and then top it off with a beverage. “It may be less of a fit for outdoor stores, because not everyone can hike to the store,” she explained—or climb, ski, snowboard, etc. to the shop. Three of United by Blue’s retail shops include coffee bars. “We wanted to create a community space where people could hang out, and we could have conversation about the brand,” says Vice President Mike Cangi. Some outdoor businesses choose to combine forces by sharing the shop space with another food business. For example, the Trailhead, an outdoor retailer and ski repair shop in Buena Vista, Colo., occupies an open warehouse with the Simple Eatery, which serves food and beer. Other outdoor retailers bite the bullet and start up that second business themselves. The outdoor apparel brand United By Blue (UBB) in Philadelphia—which has a fifth location opening in New York this June—found that integrating a café was a way to make customers feel at home. “I was turned off to the traditional retail space,” said UBB Vice President Mike Cangi. “When I walked into a boutique, I felt that I was inconveniencing the person behind the counter. We wanted to create a community space where people could hang out, and we could have conversation about the brand. Our brand is not easy to explain in one sentence,” he said. Three of UBB’s four retail locations serve coffee, which is an impetus for folks to walk inside the door—especially at locations that are off the main drag—and gives them a reason to stay. Then the opportunity opens up for them to learn about the brand’s mission and upcoming cleanups. For each item sold, UBB removes one pound of trash from fresh waterways in the U.S. or abroad. The pickups are organized in-house and invite volunteers from the community to join. The full scoop: UBB has seen challenges in the model. On average, they now serve 450 cups of coffee a day at the Walnut Street store, near the University of Pennsylvania. All the while, the 1,000-square-foot shop’s apparel line has continued to expand. “Now we have a complete line of men’s and women’s apparel and accessories, and we are competing for floor space with ourselves. There are people that want cafe seating, and we want to display the line and have spots for the entire brand,” said Cangi. He notes that while UBB introduced the coffee-and-boutique marriage to Philadelphia, the concept has since become less novel. Shops in general, not just those in the outdoor space, are popping up all over the place with espresso. Overall, for any specialty retailer that wants to serve a latte, success hinders on sincerity. In order to integrate a food or beverage service into the shop, it’s clear that the hurdles can add up. Each individual business—apparel, gear, coffee, food, etc.—requires its own skillset mastery, which takes time to establish. Business owners should hire experts in each field to help manage the business segments. Municipalities each have their own regulations regarding serving liquor, building codes for restaurants, liquor and beer licensing and liability insurance, etc. As businesses flourish—which is the goal, right?—limitations of the physical space can cause each segment to compete with one another. And the building where the current business is located may not meet requirements for an additional business like a kitchen. “If you are going to do coffee, beer and food, there are some restrictions to having a kitchen,” Mull said. “If you cook, you need venting, and your building might not accommodate for it. Or, you would need to spend quiet a bit of money to make yourself able to do those things. In those cases, it wouldn’t be a deal breaker but might be more costly. All things considered: a single shop that serves up gear, food and beer is a dreamy afternoon stopover for an outdoor enthusiast—and for the owner. “Part of this whole thing is, I’m creating a space where I want to hang out for the rest of my life—right here,” Cruikshank said.